If a show is cancelled or your "good" seat turns out to be lousy, what are your rights? We explain what you can do in these situations and more. A ticket is a contract between you and the ticket seller. 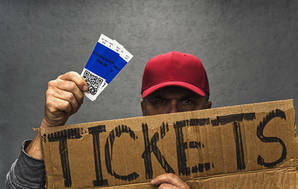 The seller has to clearly display or notify you of the terms and conditions attached to the ticket, before you buy it. A seller can't rely on terms and conditions that are only printed on the ticket, unless you were given a reasonable chance to read them before you bought it. Before you buy a ticket make sure you understand the terms and conditions in relation to cancellation, postponement, refunds and even scalped tickets. You should get a full refund on your ticket, plus any booking fee. If you bought a package deal, first approach the seller of that package. They are normally in the best position to obtain refunds for you. If promoters cancel because a performer is ill or they can't sell enough tickets, or for some other reason beyond their control, they are not required to compensate you for other costs such as airline tickets. It is up to you to buy insurance cover. Sometimes, airlines or hotels may offer a refund. The companies are not obliged to do this. It is a discretionary concession. If the new date doesn't suit, you may be able to claim a refund of the ticket price. But this won't apply if the postponement was allowed for: if it's an outdoor event, for example, held over to the advertised "rain day". Where a promoter or ticketing agent does not exercise "reasonable care and skill", you are entitled to a refund and compensation for any reasonably foreseeable consequential losses, such as travel and accommodation costs. If you are refused entry yet have a valid ticket, have abided by the rules and given no indication you might cause trouble, you may be able to claim for consequential losses. Why can't I get my refund down at the local ticket office? For large-scale refunds, mail refunds may speed processing and cut down the time customers spend standing in queues. If you're reluctant to part with your ticket, we suggest you send it registered mail and/or photocopy it for your records. A Christchurch member told us she had bought $90 tickets for seats at an outdoor concert. The promoter had cancelled, blaming unreliable weather, but a new promoter had stepped in and moved the concert indoors. The ticket prices were now $100 and $120. People who already had tickets to the outdoor performance could get $100 seats at no extra charge, pay $30 extra for the better seats, or get a refund. Our member asked if this was legal. It was. The original promoter cancelled the contract, which makes our member entitled to a refund. But the new promoter has no contract with her and can set its own prices, which she is free to accept or decline. Many shows are marketed around one or more "stars", but they may not appear in all performances. Substitutions, whether scheduled or not, are an accepted part of theatre, music and dance. If you find yourself in this situation, complain immediately. You may be able to be reseated. If not, ask for a refund. Some venues can arrange one on the spot. If not, contact the ticket office the following morning, and if necessary put your complaint in writing. If neither the ticketing agent nor the promoter is forthcoming, take your case to a Disputes Tribunal. The definition of an "A Reserve" seat often leaves a lot to be desired. It is now common practice for the promoter to hold back some seats between "A Reserve" and "B Reserve". If the bookings are good, they will be sold at the "A Reserve" price. If not, they will be released for sale at the "B Reserve" price. In our view, each grade of seating should be superior to those cheaper than it. You should be able to see and hear the entire show well from an "A Reserve" seat. If you buy "B Reserve" and "C Reserve" seats, ask what you will be able to see. Write down the reply. If you can't see as much as you were told, ask for compensation. Sometimes people complain they have sat through a lengthy support act only to find the main act appears on stage relatively briefly. Whether you have a case against the promoter and/or the ticketing agency will depend on the reasons why the main act didn't play for long and what representations were made to you about how long the main act would be. But remember: just because you don't enjoy the show doesn't mean you can get your money back! I bought my ticket privately at a price higher than the face value, after tickets had sold out from the official seller. Will I still be allowed in to the event? Selling a ticket privately for an inflated price (often called scalping) is not illegal, generally. However, some ticket sellers have special terms and conditions stating that if they are aware the ticket has been scalped, the holder will be refused entry. Make sure you ask about this before you buy. The government is also proposing a law that will make it illegal to scalp tickets for major sporting events. What if the ticket sellers deny liability? Ticketek, the biggest ticketing agency in New Zealand, says it simply enables the consumer to make a contract with the promoter. In other words, unless it is negligent, or promises something different from the promoter, it would not have to refund or compensate you. We disagree. We believe ticketing agents have specific duties in law which are separate from those of the promoter. In our view, they must use reasonable care and skill in selecting and allocating seats, and should advise consumers of any limitations on what they will be able to see and hear from those seats. We expect ticketing agents to be confident through their own assessment (where practicable) that consumers will be able to see and hear the show, and not just take the promoter's word for it. They should check that the more expensive seats are indeed better than cheaper ones. Our comments do not apply to a travel agent who might obtain tickets from a ticketing agent on your behalf. Travel agents in this position are acting as your agent and, in our view, would not be liable for a failure on the part of a promoter or ticketing agent. Hundreds of consumers are being ripped off by ticket resale sites like Viagogo and Ticketmaster Resale. Our investigation with Australian consumer group Choice identified inflated prices, hidden fees and misleading sales tactics as major problems in the ticket resale market.